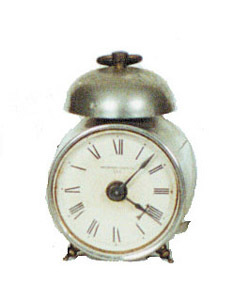 Waterbury Clock Co. alarm clock, "Wasp", ca 1893. One day time and alarm. The alarm hand is not like others pictured. 3 1/2 inch nickel case, beveled glass. Runs and quits-needs service. Signed on front and back. Ly-Waterbury No.76.